This picture, taken by fire marshal Scott Strassburg, shows the aftermath of a cooking fire in an apartment within a complex. The door between the apartment and the corridor was left open which allowed the fire to spread. However, the corridor had two fire doors, one leading to a stairwell and one leading to more apartments. Both of these fire doors remained shut and managed to contain the fire to the corridor and therefore greatly reducing the impact of the fire and the effect on people’s ability to escape. 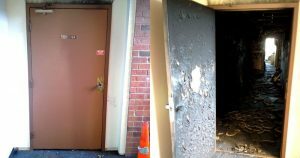 The door in the picture shows the exit door leading onto the corridor affected by the fire; you can see how much damage the door prevented. Unfortunately, due to the apartment door being left open, the fire spread to the corridor where significant damage was done to the other apartments that had doors left open during the fire. Therefore this picture shows not only the importance of a properly installed fire door, but of proper fire door etiquette needed to reduce damage. Doorstuff sell fire rated intumescent seals, hinges, and door closers that are needed on a fire door. We also offer products and advice on how to make your pocket door a fire door such as the iMpero fire door FD30 pocket door kit. This entry was posted in Fire Doors and tagged door closers, fire door, fire rated, hinges, impero FD30, intumescent seals, pocket fire doors. Bookmark the permalink.